Shine Enhancing Organic Shampoo + Conditioner Bundle by Madara, save money when you buy your Shampoo and Conditioner in a bundle. 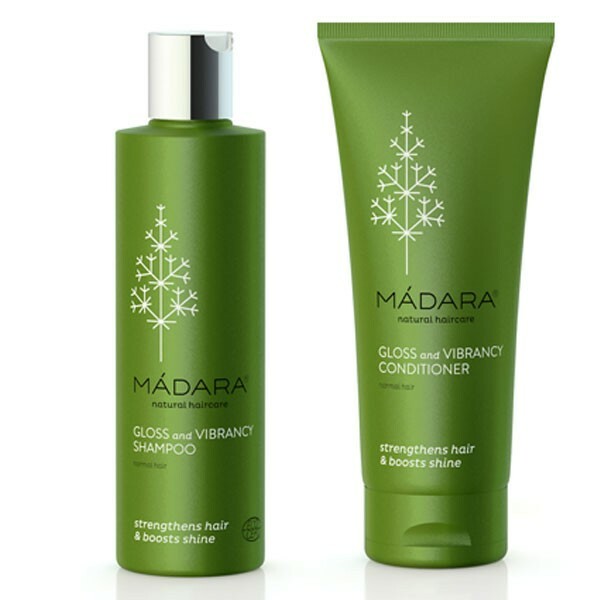 Madara Gloss + Vibrancy Shampoo - Shine enhancing formula gently cleanses and strengthens hair, and also adds radiance and silkiness. It calms the scalp, prevents dry ends and leaves hair healthy and strong. Madara Gloss + Vibrancy Conditioner - Shine enhancing conditioner with Northern Birch and Cranberry deeply nourishes and strengthens hair leaving it looking shiny and easy to manage. Enriched with Baltic botanicals - nettle, linseed, plantain, chestnut, and apple. Certified Organic with Ecocert and suitable for Vegans. Enriched with Baltic botanicals - linden flower, chamomile, birch, plantain, hop and cranberry.